Planning to visit Pigeon Forge in the summertime? From June to August, the Smoky Mountains see temperatures in the 80s and 90s during the day. With plenty of warm, sunny weather, summer in the Smoky Mountains is the perfect time to explore Smoky Mountain swimming holes! 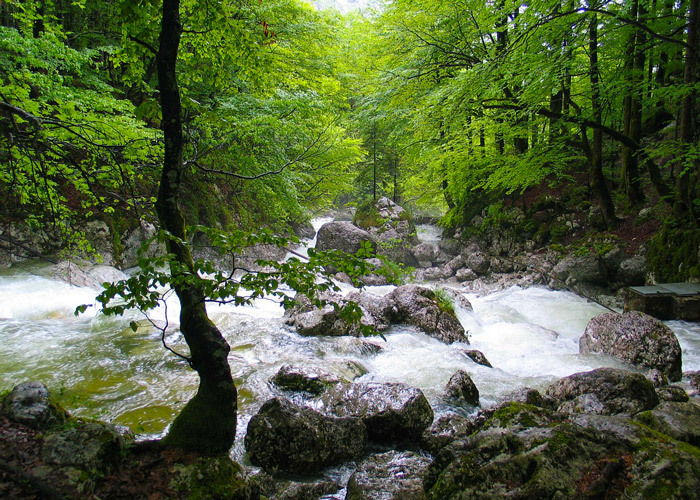 Starting on high mountain peaks, small springs feed a network of streams and rivers that cascade through the mountains. It's estimated that there are over 2,900 miles of streams in the national park, so you won't have trouble finding a place to go for a swim. Not only is this water pristine, it's also cool and refreshing even on the hottest summer days! Even during the hotter months, the streams and rivers in the Smokies stay around 60°F, the perfect temperature for cooling off in the summer. 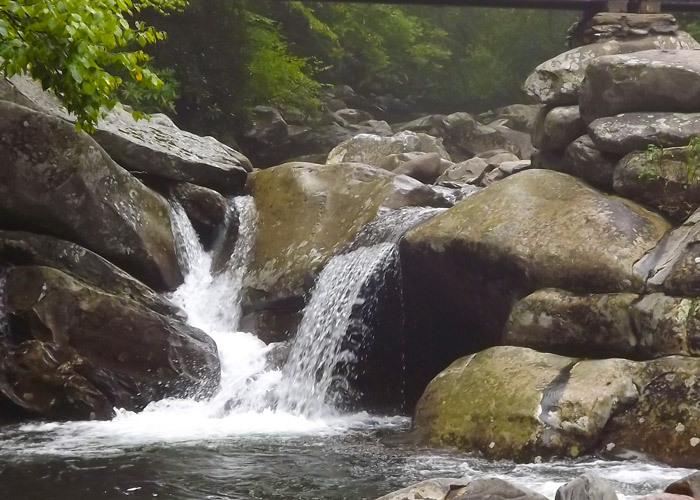 Check out our list of the 6 best swimming holes in the Great Smoky Mountains National Park! We've also got directions and safety tips for visiting these beautiful destinations in the Great Smoky Mountains. Pronounced like the letter "y," the Wye in Townsend is at the meeting of the Little River and the Middle Prong of the Little River. Here, the road also splits to form a "y," with one road going to Cades Cove and the other going to Elkmont and Gatlinburg. The Townsend Wye is one of the easiest swimming holes to access and it's also probably the largest swimming hole in all of the Smokies. Two rivers meet at this spot, forming a large pool. This area gets plenty of sunshine, so you'll see plenty of swimmers working on their tan! There are some small rapids to play in and some nice large rocks to lay-out on. There's also a sizeable beach and grass field that's perfect for setting out a blanket for a picnic. On a warm sunny day, you can expect to see big crowds at this swimming hole. Luckily, there's plenty of room for everyone to relax and enjoy a great day on the water. Directions: The Wye is located less than a mile from the Townsend Entrance of the National Park. You'll find a parking lot and lots of roadside parking just before the Townsend Entrance Road splits to go to either Cades Cove or Gatlinburg. Greenbrier is home to some lesser known swimming holes that offer more peace and privacy than some more popular destinations. However, this area is popular with locals, so you can be sure Greenbrier is a great place to go for a swim! The Little Pigeon River flows through the Greenbrier area of the Great Smoky Mountains National Park and creates several deep pools surrounded by large rocks. The river is wide and rocky, so it's a great place to sit in the sun and dip you're feet into the cool water. Directions: From Gatlinburg, take the East Parkway 6 miles. On the left, you'll see the Greenbrier National Park entrance. Take this entrance a few miles on a gravel road until you find a suitable turn off to park. You can also continue to the Greenbrier picnic area to find parking. The Sinks is one of the most impressive waterfalls in the Great Smoky Mountains National Park and it's also the site of a great swimming hole! Located on the Little River, this swimming hole is easy to access and it's very deep. This unusual spot in the river was created when logging companies used large amounts of dynamite to break up a log jam that had formed at a bend in the river. As a result of the large explosion, the loggers created a lovely waterfall and a deep pool that's perfect for swimming. When enjoying a dip at the sinks, don't go near the powerful waterfall. Strong currents and slippery rocks make this area dangerous. You may also see some swimmers jumping from rocks, but park rangers will give out fines for this reckless behavior. Directions: From the Townsend national park entrance, drive 5.8 miles of the Little River Gorge Road towards Elkmont. From the Sugarlands Visitor Center near Gatlinburg, drive 11.5 miles towards Cades Cove. The waterfall is located right by the road, so this swimming hole is easy to access. 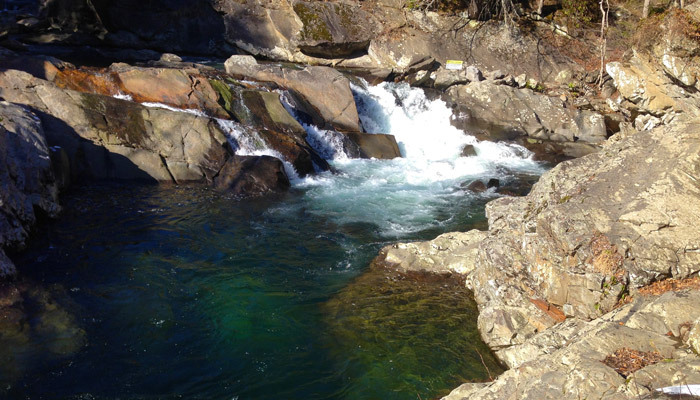 Named a top swimming hole by Blue Ridge Outdoors, a regional outdoor adventure magazine, The Midnight Hole is an excellent swimming hole in the North Carolina side of the park. This picturesque swimming hole gets its name from the beautiful dark blue colors of this mountain pool. The upper tier of the falls above the Midnight Hole is a 6 Ft tall waterfall. If you're interested in tubing, there are several river tub companies serve the Deep Creek area of the national park. Directions: There's a 1.4 mile hike to reach the Midnight Hole. Simply take the Big Creek Trail from the Big Creek campground area in the North Carolina side of the Great Smoky Mountains National Park. If you hike another .5 miles, you'll reach Mouse Creek Falls, a 45 ft. tall, multi-tiered, waterfall. Though the Chimney Tops are an incredible place to see panoramic mountain views, the hike to the Chimney Tops passes by a great swimming hole. At the beginning of the Chimney Tops hiking trail, a bridge goes over a wide, rocky section of the West Prong of the Little Pigeon River. In between large boulders, there are several nice pools for taking a dip in the pristine mountain water. Keep in mind that this is a higher elevation swimming hole, so the water is likely to be colder than other lower areas of the park. Directions: To reach the Chimney Tops Trailhead from Gatlinburg, drive 7 miles on Newfound Gap Road towards Newfound Gap. You'll find parking for the trailhead on the right side of the road. Located on the banks of the Little River, there's a lesser known swimming area complete with a small beach and a deep mountain pool. Although this spot doesn't offer much in the way of rapids or waterfalls, it’s a pleasant place to cool off in the warm summer sun. Also, it’s a less crowded swimming hole in the Smokies, so you can enjoy the beauty of the river without having to share it with too many other visitors. Directions: This swimming hole is located between Metcalf Bottoms and Elkmont Road on the Little River Gorge Road. From Metcalf Bottoms, drive 2.4 miles. After you cross a bridge, there's a small pull-off on the side of the road where you can park to go to the swimming hole. Driving from Gatlinburg, you'll reach the same spot about 4 miles after Elkmont. No matter where you swim in the Smoky Mountains, you'll need to exercise the utmost caution. Swimming in natural waterways always poses more dangers than going to a manmade pool. Though there are lots of places to swim in the Great Smoky Mountains National Park, there are some areas that we do not recommend for swimming. Abrams Falls near Cades Cove is one spot that is particularly risky. This is the highest volume waterfall in the Great Smoky Mountains National Park, so it produces strong currents. Over the years, swimmers have become victims to the powerful currents and undertow created by the falls. As an added hazard, rocks near the falls are slippery from algae. Numerous people have fallen and been injured. Officially, the Great Smoky Mountains National Park Service does not recommend water recreation in the Smokies. Before you go enjoy a fun day in the sun, please review the park service's water safety guidelines and practice caution while taking a dip in the cool waters of the Smokies!